It’s shaping up to be a busy and exciting year for our MPG team, so we thought we’d share just a bit of what we’re up to at the moment. We’re now moving full-steam ahead with creating a Broadway-caliber revue of American music to be performed as the Cincinnati showcase at the World Choir Games this summer in Shaoxing, China. The World Choir Games, for those who aren’t familiar with them, are billed as the Olympics of choral music, with choirs from around the world converging for two weeks of competition and camaraderie. In 2012, Cincinnati will be the first American city ever to host the games. But first, there’s Shaoxing! When the 2010 games take place there, Cincinnati will be represented in a spectacular intended to give attendees a preview of what’s to come. MPG is working with the Greater Cincinnati Convention and Visitors Bureau and other city leaders to create a show celebrating the rich history of American music and the influence it has had on music worldwide. We’re crafting the show from start to finish with world-class writers and musicians, and currently are interviewing choreographers. Next up: auditions for singers/dancers in Cincinnati and NYC. Make sure to check back at our blog, where we’ll be documenting all the fun. MPG is so proud to be bringing the spirit of American music and Cincinnati’s spirit of camaraderie not just to China but to World Choir Games attendees from across the globe. More soon on this exciting project! Closer to home, our team is hard a work putting the finishing touches on the TechOlympics Expo 2010, which will bring Greater Cincinnati’s brightest technology minds together with business leaders in the technology field. MPG is handling all logistics for this three-day competition, which takes place March 5-7 and is presented by INTERalliance of Greater Cincinnati, a non-profit collaborative of regional businesses and educators dedicated to promoting careers in the local technology industry. Pre-qualified students from the Cincinnati/Dayton/Northern Kentucky region will participate in events ranging from today’s most popular video game challenges to programming-based competitions designed to showcase their knowledge and skill in technology-related endeavors. It culminates with presentation of the INTERalliance cup, awarded to the school whose team earns the highest number of points across the full range of technology-based events. We’re so excited to be working with the best and brightest IT minds our region has to offer, bringing them opportunities to showcase their talents and seizing the opportunity to learn from them as well! This incredible event is sponsored by several amazing companies, including Procter & Gamble and Kroger. Check back soon for more MPG news! It’s New! It’s Whiz Bang! And Your Guests Might Just Ignore It. The Consumer Electronics Show was last weekend and like the rest of the world, we were excited to get a glimpse of the gadgets that just might change our world. CES always brings new ideas to our MPG team, plus a renewed excitement about the job we do, helping clients engage their audiences with memorable, interactive experiences. It also reminds us of conversations we have from time to time with clients who are curious about the latest presentation technologies. They wonder if they can save money by using touchscreens, for example, and reducing or eliminating live presenters and hosts at their tradeshow booths. They get wowed by bells and whistles and wonder if their guests will be wowed as well. We are always happy to discuss new technologies. And we never hesitate to propose them or incorporate them in our experiences if they’re the right solution to help clients achieve their goals. But we also feel a responsibility to educate clients about the drawbacks of using technology for technology’s sake or of relying on technology as a cost-cutting tool. You may be able to fit more content into a kiosk than, say, a live presentation, but how can you guarantee your guests will stick with the touchscreen long enough to absorb all of that information? Think about the amount of time you personally are willing to stand and interact with a computer. It’s easy to walk away if you get frustrated with the interface or if you hit a section of content that you find less intriguing. The experience can be made more interactive when it’s set up as a game, but many of these interfaces are based on a trivia question model. Is that the most effective way to communicate a sophisticated or more nuanced message? Technologies such as touchscreens can be used to collect data that you can use to continue marketing to and interacting with prospects after the show. But how qualified are those leads if the guest did little more than surf around and then walk away? How will you entice guests to approach and interact with your technology? Too often we have seen tradeshow booths filled with an array of slick, high-tech experiences—that nobody was using. Computer screens just aren’t that inviting. And if you think about it, these kinds of experiences are actually quite commonplace. You encounter them at the bank, at the grocery self-checkout, in your favorite video games. 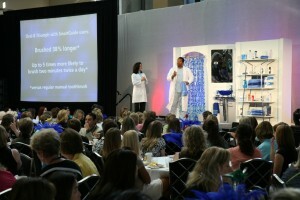 Tradeshow attendees are seeking something different from what they experience every day. Ironically, more traditional, human interactions might just be seen as unique amid a sea of impersonal machines. All this is not to scoff or turn our noses up at technology. We’ve done some amazing projects that have woven together new technologies and human interaction. However, it’s the human touch that, we feel, is key to a successful booth experience. You can make certain that your entire message is heard and absorbed. Certainly, a live presentation accomplishes this, but you also can get the best of both worlds when a touchscreen or other high-tech experience is guided or otherwise facilitated instead of left for booth attendees to interact with as they will. You can carry on real conversations, answer questions and offer more in-depth insight when, for example, professional hosts are enlisted to provide hands-on demos. You don’t have to limit yourself to a traditional live presentation (though we demonstrate time and again that a professionally produced show is a proven method for delivering motivated, qualified leads to sales representatives). The right creative concept can create interactivity in lieu of having people sit and listen passively to a message. Plus, technology can still play a role when you incorporate Twitter, for example, or other methods for getting guests into the action. CES was exciting for anybody who is interested in how we will experience the world in the coming years. And it reminds us that, in an age when everything seems to be automated, self-serve and computer-based, you simply can’t do without a human touch. The experiences that will truly stand out and be memorable will be the ones that engage people on a personal level. Greetings from MPG! We’d like to open our blog with a quick report from team members who’ve been in Frankfurt, Germany, this week, talking with leaders of The World Choir Games about our involvement in helping produce shows for Shaoxing, China, and Cincinnati when the games come here in 2012. It’s been an inspiring couple of days, and a wonderful collaboration. Lots of work to do, but we’re up for the challenge. Singing together brings nations together! Dental professionals who visit P&G Professional Oral Health (Crest + Oral-B) at 2009/2010 trade shows, found a new, more interactive experience in an exciting new environment, thanks to MPG and design partner Inter-Global Exhibitions (IGE Group). “Breakthrough.” “Incredible.” “Flawless Execution.” Those are just a few of the words used by P&G Oral Health leadership to describe the new experience, which combines hands-on science and opportunities for professionals to try featured products for themselves — all in addition to the engaging presentations and world-class hospitality that visitors have come to expect from P&G and MPG. a clinical plaque-imaging study conducted live on-site. Responding to today’s demand for lighter, more flexible booths that are easier and less expensive to ship and assemble, IGE worked with MPG to house the new experience in an environment that brings P&G Professional Oral Health’s equity of science and innovation to life. MPG successfully defended its account with P&G Professional Oral Health after an intense RFP process that pitted the agency against some of the giants of the experiential marketing industry. 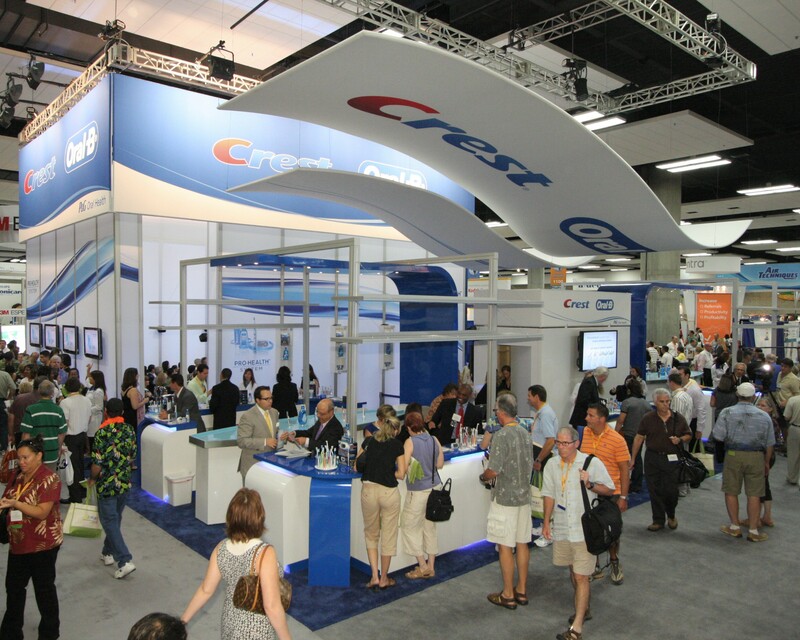 Our winning formula included top-notch creative, a true understanding of the dental professional, and our ability to deliver the new experience within a tight budget. When Crest + Oral-B wanted to introduce a game-changing new product in a way that key influencers wouldn’t forget, then turned to Moening Presentation Group. The Triumph with SmartGuide launch was so successful that Exhibitor Magazine took notice. Read the article here!